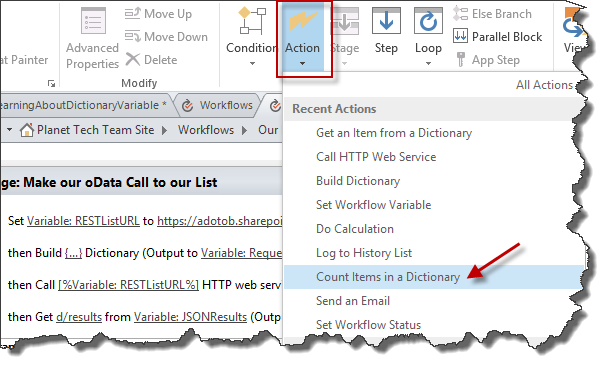 Now before we get too deep into The Dictionary Variable/Object, lets take each of these actions one at a time in a simple scheme and see what they do exactly; kick the tires so to speak, in our real world example we will NOT be creating the Dictionary Object as much as consuming JSON data and dumping the JSON data inside a dictionary object. You get it right? 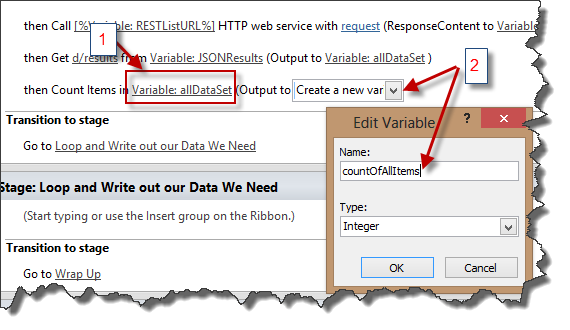 JSON data usually comes across as a JSON Array or JSON object, in our case we want that JSON array, even if it is one item, the Dictionary Object/Variable EXPECTS to see an array, I actually wrote a blog post http://fabiangwilliams.wordpress.com/2012/12/31/limitations-when-using-sharepoint-2013-workflows-to-return-json-data/ explaining that issue, which i think is a BUG that should be handled by the SharePoint Team. But lets leave that on one side for the moment and get back into our intended post. As mentioned earlier, a Dictionary Object may be considered a collection of related items. Now to drive this point home lets use what we have at our disposal, in fact we will use two (2) examples, the first of which is to simply build on what we did in Part 1 using the Bank of Fabian Example. You see, there are ALOT of post out there that do a good job of explaining to you how to get Weather Data, Twitter Data, ITunes Data, you know all the public REST JSON available stuff, and granted I will do one here as well in example number two in the spirit of being complete. 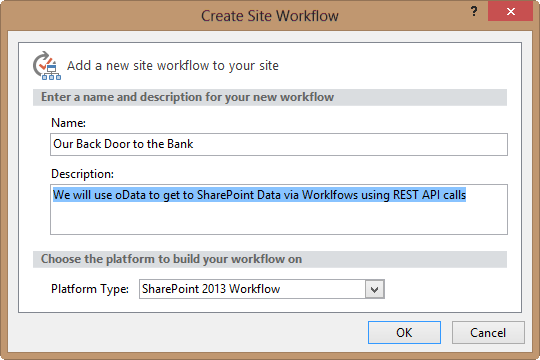 However, what you don’t often see is showing how to use SharePoint own REST OData examples, so I will do one here. Lets set it up for you. Now admittedly that is also difficult to read, so you should invest in the FREE JSON Viewer I always use and its Waaayyy cleaner, just cut and past the entire content and you can see what I mean. 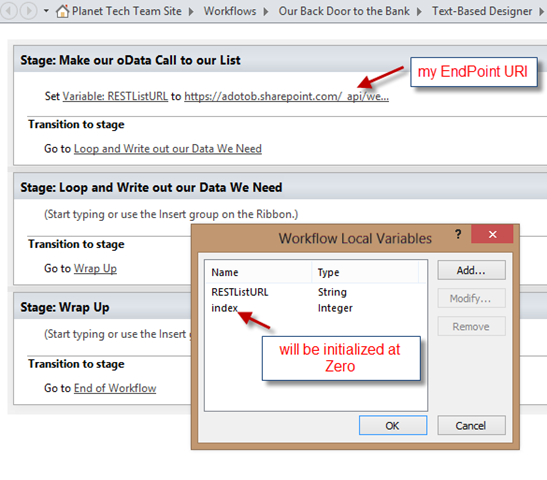 1 – You will then click on ‘this’ which will open up the dialog in  and in turn you will click the Add button. 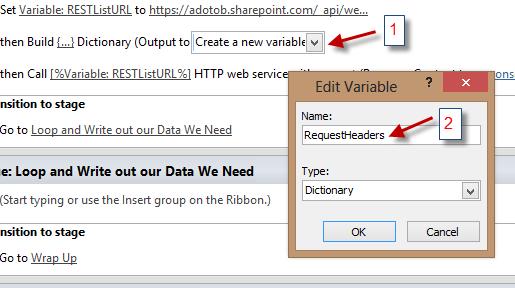 In doing so you will enter two Variables into this Dictionary Variable of String Data Type as aforementioned, in  I am showing you how i do it for the Accept header attribute. When you are done, click the Ok Button. 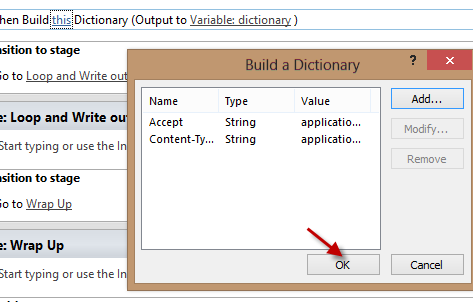 AND NOW YOU HAVE SEEN HOW TO CREATE A DICTIONARY VARIABLE and an acceptable use of it. 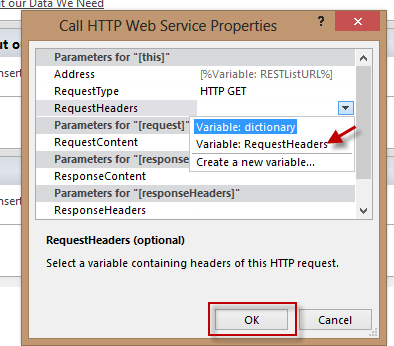 So again by clicking  ‘this’ we get the dialog box to enter the information about our HTTP REST Service which in this case we click on the ellipse  and put our workflow variable we created earlier that holds our URI, then we click  the OK Button. 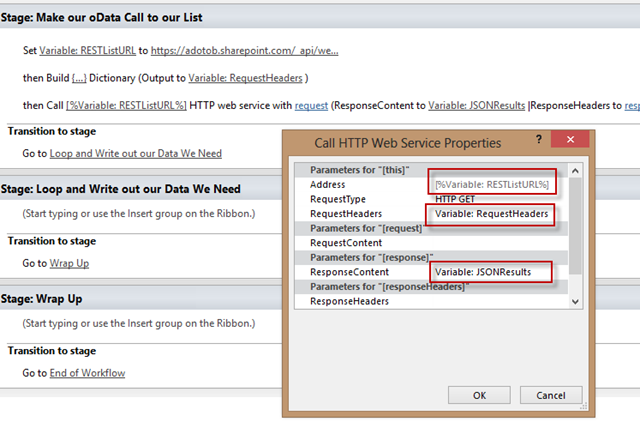 Now that that is done, we want to further configure the Service Request Call so we will ‘Right Click’ on our ‘Call’ and then Click on Properties..
Once we do that we will want to click the ‘item by name or path’ link and give it the SUBSET or WHOLE path to the data we inspected in our JSON Viewer or whatever tooling you have to determine what you need. 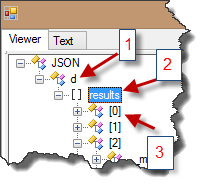 In our case we want the “d/results” subset then we will use the Index variable to get each line item. Furthermore we will want to store this information AS WELL into another Dictionary Variable. 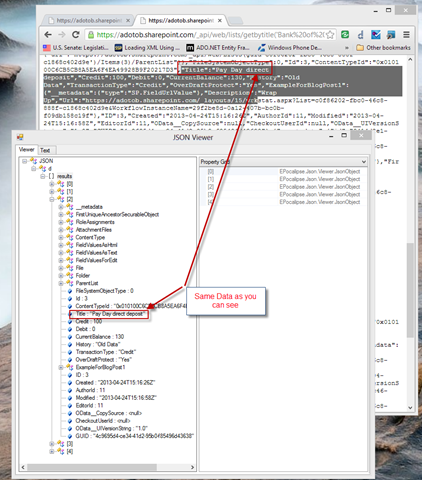 So in  you have me setting the path based on what i want from evidence in the JSON Viewer, then in  I am showing you the relationship of use getting the values from the HTTP Call made earlier and finally  I’m dumping that data into another Dictionary Object. if you forgot here is what i need to build that path take a look above at , then  to get my Array. 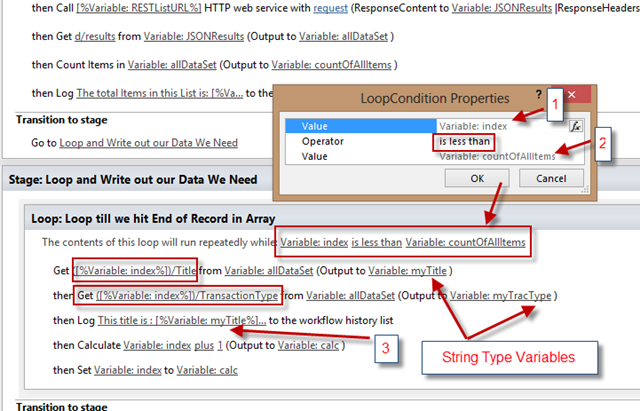 In  I will use that below using the Index Variable inside a Loop Construct. and we now need to tell the action which Dictionary Item to count, REMEMBER we want the one that we did the Subset of, not the one returned from the Service Call. Now when that’s all done, WE are done, one more Screen Shot and some guidance and you can take a mental break..
Now admittedly its a bit busy, and yes, its been hours now since I started on this blog and fatigue is setting in 🙂 but I think i can capture everything I need to say here, and I will wrap up as usual with a video. So we are setting the Initialize and Upper bound of our Loop counter in  and  respectively. In  we are actually going to WRITE OUT TO THE LOG the information garnered from the above two lines and the remainder is the Loop Counter which you saw in Part 1, so now time for the video of it all. So this blog post is long enough, what I will do for the External Data Call is do it in another Post and I will Link to it here. Hope you learned something new. your examples and insights are very helpful. I have found nothing as complete and useful as those you have provided. I am now however a bit stuck. 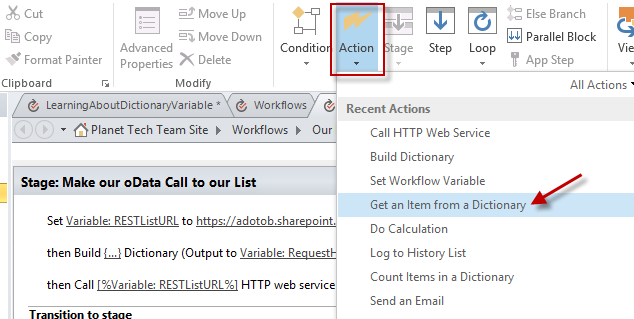 Everything from Microsoft and elsewhere is all about using GET type scenarios with workflows to pull information from SharePoint. I have a situation where I need to PUT information to a 3rd party service and I can’t find anything that really helps. I have a couple of issues. First is that its unclear how to create and send the payload (request). 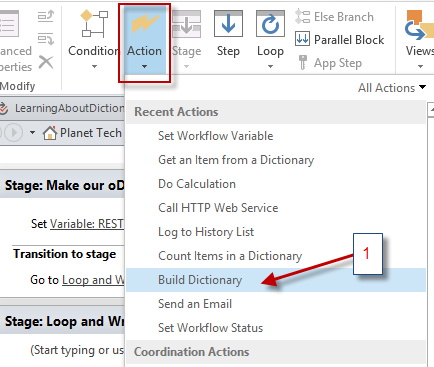 I have tried both dynamically creating and sending XML (in a Dictionary) as well as simply crafting a rather complex Dictionary containing all of the data. 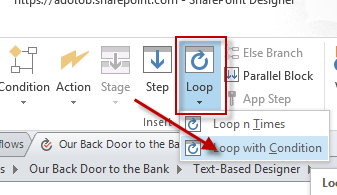 Do you have any insights on how to best go about a proper PUT using a SharePoint 2013 Workflow? 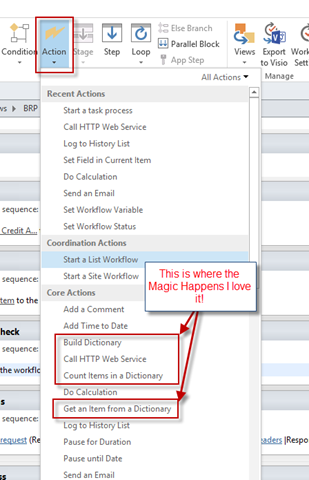 To be very specific, the area that I believe is tripping me up is simply not knowing how the mechanics of SharePoint’s Call HTTP action works when calling a REST service that is not hosted by SharePoint. Thank you for the accolade, I am only too happy to help. 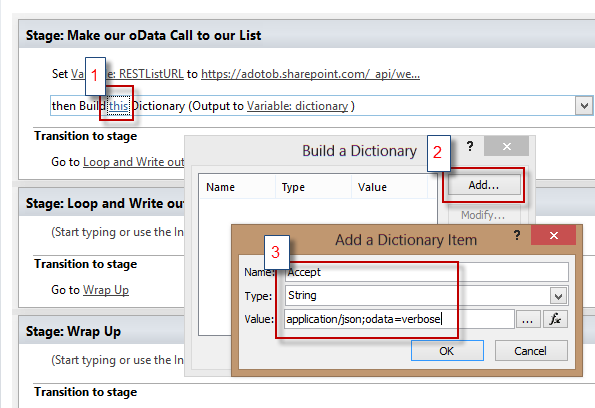 So… and probably I am missing something but “PUT” which is synonymous to “MERGE” as a HTTP verb is for updating items which will need an ETag if you are working with SharePoint. If indeed you need to add an item “put an item” then you are talking about a “POST” HTTP verb. in that way you would need to send it via two ways (1) Request Headers or (2) Request Content and I would recommend JSON key value pairs. The Service you are connecting to also will need to support those actions otherwise your efforts are futile. Let me see if I can do a Blog Post specifically around that, cant promise anything immediate but I have a few upcoming engagements that I will work it into. Specifically the [1,2,3] part! Any help appreciated. I have not tried actually. 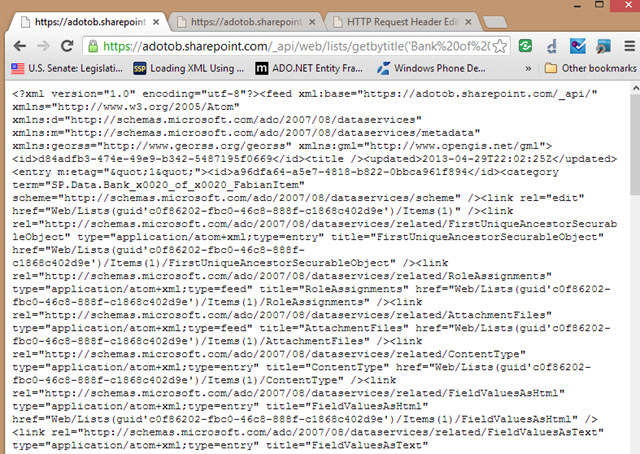 Would you be kind to help me create a SharePoint 2013 list from an XML file. 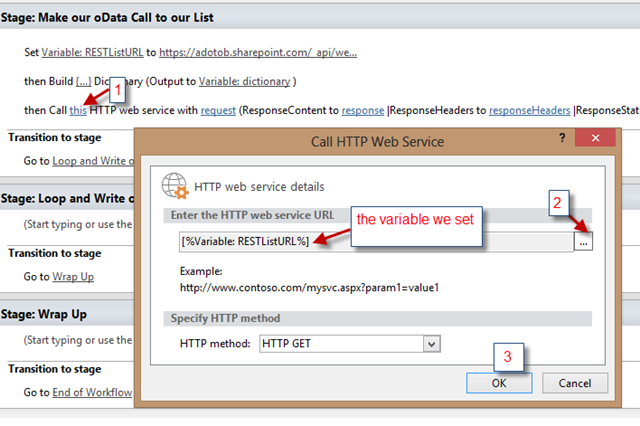 We have a huge data in the form of XML file which is external to SharePoint site. 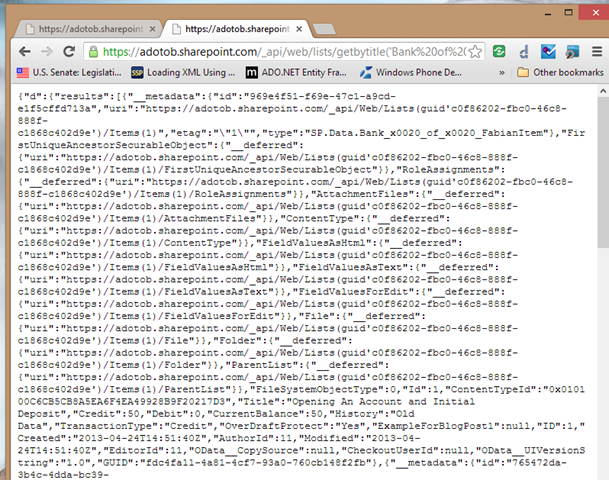 So we need to bring it into our SharePoint 2013 site, and use it for search purposes and other manipulations. How can i go about creating a list using this XML file?. while BCS and an External List can derive from any data source including XML or a Flat Text File, the issue you will have is File Locking because in the end its a file on a disk. I would suggest you either use BizTalk or another technology to port your Data out of XML into a RDMS and then use BCS as normal from that data source.